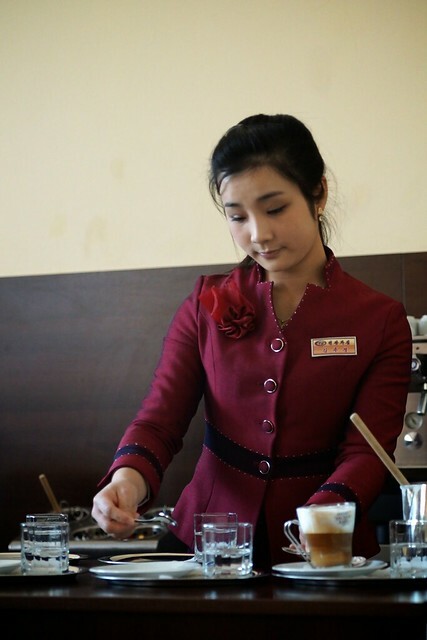 Getting your caffeine fix in North Korea can be quite a challenge. A tasteless cup of instant coffee is usually provided with hotel breakfasts, and a cup of instant can be mixed up for a Euro at the various rest stops and lunch/dinner restaurants. But coffee lovers don’t despair; a proper latte or cappuccino can be had at the Viennese Coffee Shop located off Pyongyang’s Kim Il-sung square. The coffee shop is open for tourists and doesn’t require a prearranged permit, just ask your guides if there is time to stop by. While located in Pyongyang, a latte at the Viennese Coffee Shop will cost as much as one goes for in the Austrian capital! 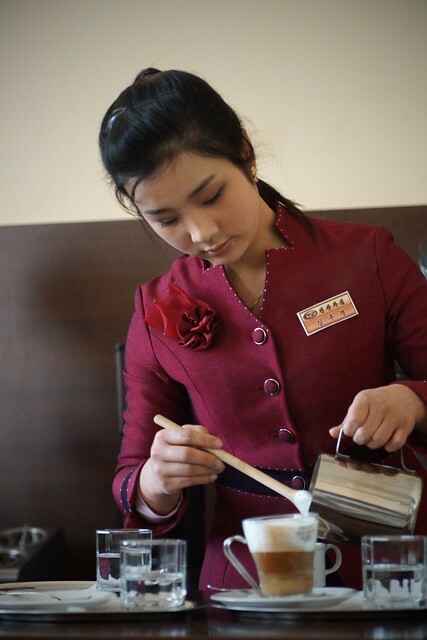 Not only does this lovely North Korea barista whip up a great cappuccino, she is also a champion foosball (table football) player. Ask her to play a couple games; an hour of foosball at the table in the back room goes for a Euro. 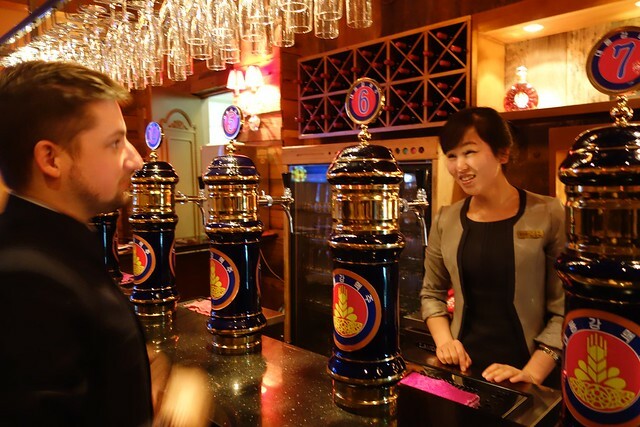 Josh Thomas and Ms Yu enjoy draft beers at the bar of the Yanggakdo Hotel Microbrewery. 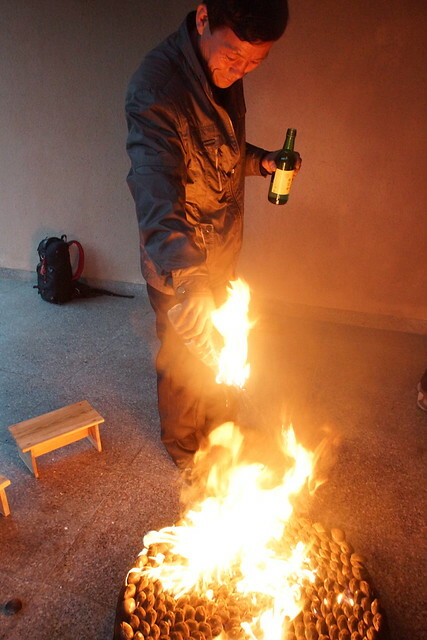 You approached me to arrange a trip to DPRK with a focus on beer and nightlife. 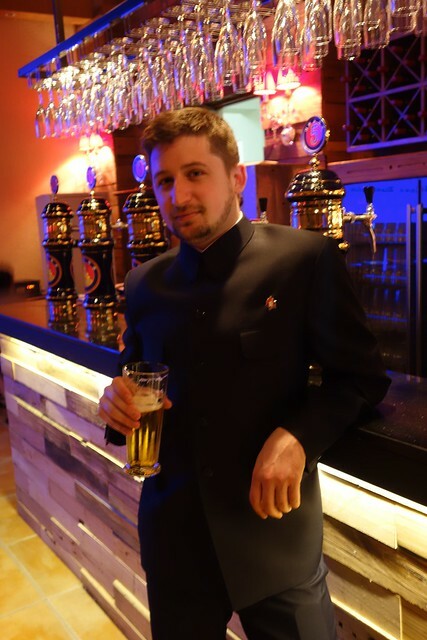 As a craft beer expert did the DPRK live up to your expectations? It absolutely did! It actually far surpassed it. 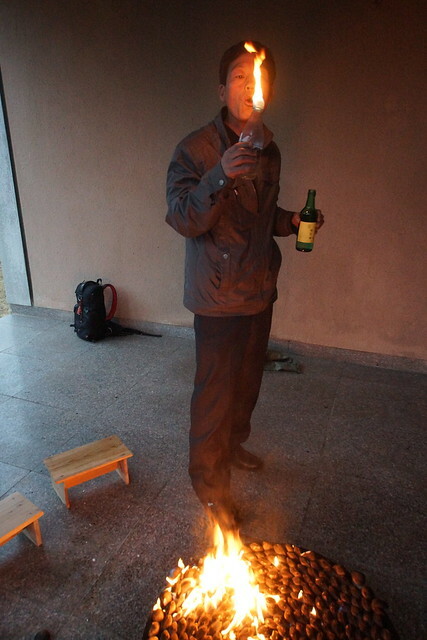 Like many things about North Korea, there wasn’t much information available about what the drinking culture was like there, but what I did know was that Koreans, North and South, love to socialize over alcohol and the rumor was that North Korean beer far surpassed the quality of South Korean beer. With the exception of a small number of American-style craft breweries in Seoul, this was 100% true! North Koreans do much more with much less and really seem to embrace the idea of experimenting with their brews. I fully believe that beer, being the one beverage found around the entire world, is a great unifier among all cultures. For me, as a home brewer and overall global beer nerd, I knew it would be one cultural aspect that I would share with the North Koreans. And it was true! Nothing was more special on this trip than the smiles shared over a beer, comparing and critiquing the beers, and talking about the differences between American beers and North Korean beers. There is no propaganda over beer, just real conversation, smiles, and drunken stumbles back to our respective rooms. And yes, North Koreans get hung over too. We visited a lot of venues and drank a lot of beer on the trip, where were your favorites and why? The best beers we sampled were found at the Paradise Microbrewery. Quite an interesting find in North Korea, it seems to operate as a highly independent brewing company, outside the confines of the state brewing Taedonggang Brewery. Unfortunately the brewer was not around when we visited, and the bartenders knew very little about beer and wouldn’t let us visit the back where the beer is made, but whoever made the beer seemed highly knowledgeable about beer. In my opinion the Paradise Pale Ale was the best beer of the trip! Beers on tap at the Paradise Microbrewery bar. Without a doubt the best venue was Yanggakdo Hotel. Not necessarily because they were my favorite beer we sampled, but because I was able to meet the brewer and even visit the microbrewery where they made the beers. It was a bit sad to see eight 25 gallon fomenters when there was no chance of them using more than one at a time due to the famine, but the smile on the young lady brewmasters face when I told her that I thought she had the best job in North Korea was the most heartwarming moment of the trip for me. 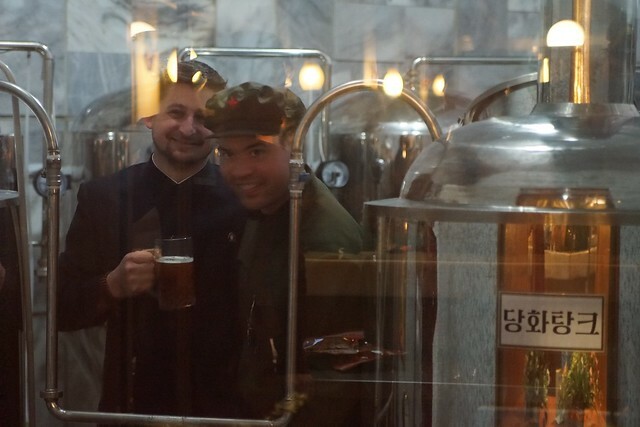 Josh Thomas and Jordan Harbinger visit the Yanggakdo Hotel Microbrewery. 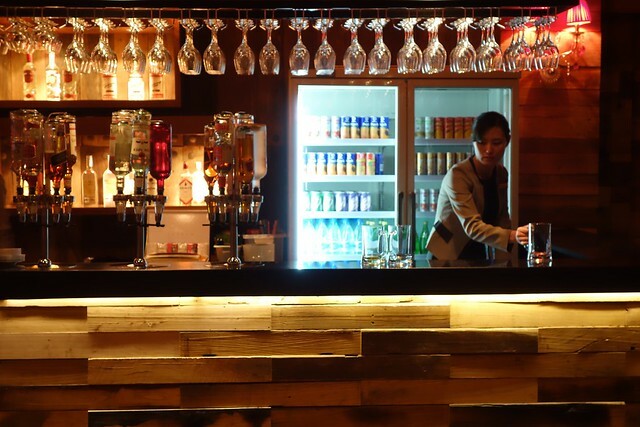 Tell me about the craft beer served and the venues at the Yanggakdo Hotel, the Paradise Micro Brewery, and Taedonggang Brewery Bar. Beer in Asia, recently imported American-style craft breweries aside, is largely based on American-German style pale lagers. These beers, like Tsing Tao in China, OB in South Korea, and Asahi in Japan are roughly similar to the American-German pale lagers like Budweiser, Coors, and Miller. Fine for a hot day when you need a cold beverage, but not something I’d choose first – I said I’m a beer nerd, not a beer snob, I will drink a Tsing Tao on occasion, as I live in Hong Kong! I’d much rather enjoy a Harpoon IPA or Mikkeller Hop Bomb Challenge given the choice! 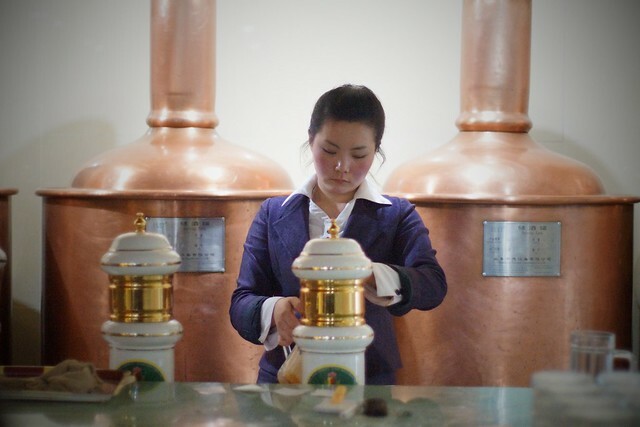 Interestingly enough, economic sanctions in DPRK have lead to an entirely different tradition of brewing, not found elsewhere in Asia. Electrical shortages, causing unexpected and spontaneous power outages, mean that the refrigeration required for lagers is simply impossible. Budweiser-style, largely tasteless, lagers such as is popular in South Korea (OB and Hite) simply cannot be brewed. As a result, North Korean beer is ironically a “steam beer”, the only type of beer invented in the United States. A “steam beer” (better known in the United States from the brand Anchor Steam) is simply a lager brewed at Ale temperatures giving increased flavor, a pronounced bitterness, and a greater body. Crazier still was their affinity for stouts and porters in the DPRK, serving us elegant Coffee Porters and Chocolate Stouts. Their own discovery and version of a Pale Ale was astounding considering the lack of formal brewing training available to the budding brewmasters. 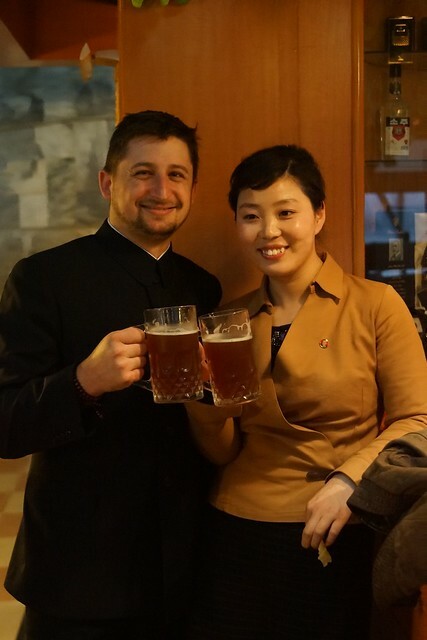 Speaking with one of these brewmasters at the Yanggakdo Hotel, I encouraged her to try brewing an American-style India Pale Ale, if she was able to get the hops imported. If I learned anything from the North Koreans, however, is that they make do with what they have. I’d love to try her result! 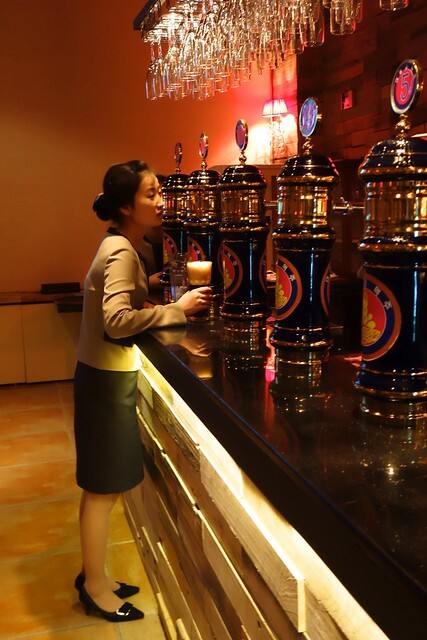 Taedonggang Craft Brewery Bar Pyongyang, North Korea. Tell me about your experiences in the more local venues? Well I’m a bit of a cynic. Some of the local experiences I truly believe were local. Some of the experiences I think might have had some actors planted to stand between the tourists and the real locals. 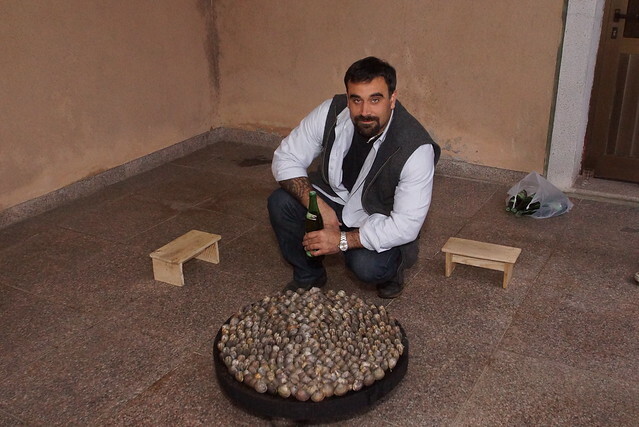 The diplomatic club and the clam bake in particular were great local experiences. It was amazing to see some Koreans finally ‘let their hair down’ so to speak, and stop being mascots for their country, and start being real people. 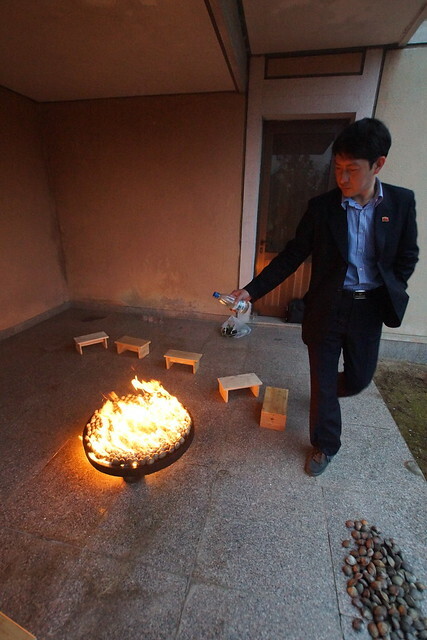 Over the Nampo Hot Spring Hotel clam bake I got to know our bus driver, Mr Lee. It was over this meal, while he poured petrol over live clams, blowing out his bottle when it caught fire, and downing huge amounts of “Pyongyang Vodka”, a 40% alcohol form of Soju, that I really became friends with this quiet and unspoken man. He was unbelievably friendly and never stopped smiling and really seemed to love hanging out with us whenever he could. He, more than anyone else, became my true friend while in the country. 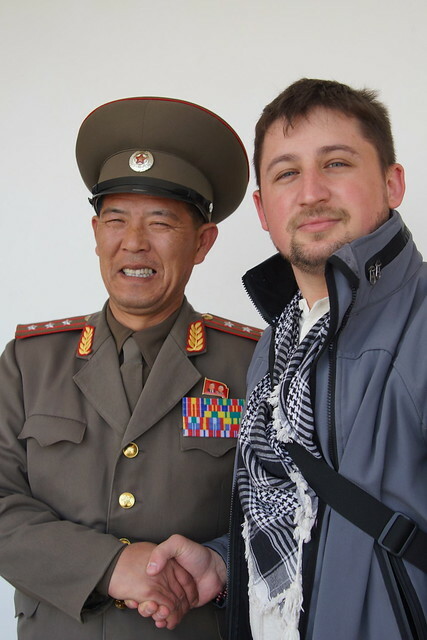 What surprised me the most was that he quietly told me that he used to be a soldier in the North Korean People’s Army. Its hard to wrap your mind around, as an American, this short, quiet, and friendly man was once a soldier in the army we seem to most fear in the west. What was your favorite experience of the trip that was not related to drinking? Undoubtedly the petrol clambake. Part of traveling around the world for me is trying local foods. North Korea, in the midst of a famine, doesn’t necessarily have “local” foods that they would be comfortable offering to foreigners without being embarrassed. 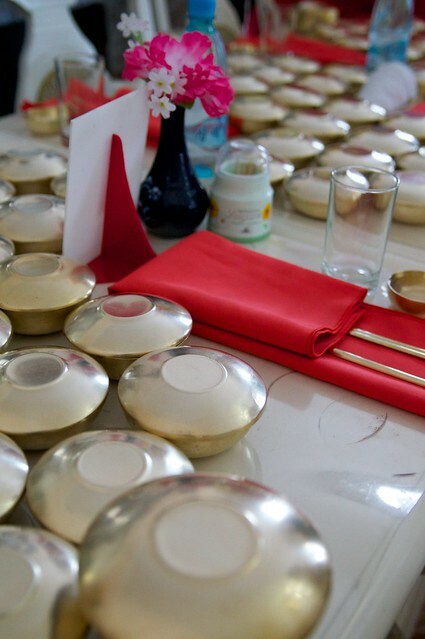 Much of our food was simply iconic Korean foods such as kimchee, banchans, and prawn pancakes. 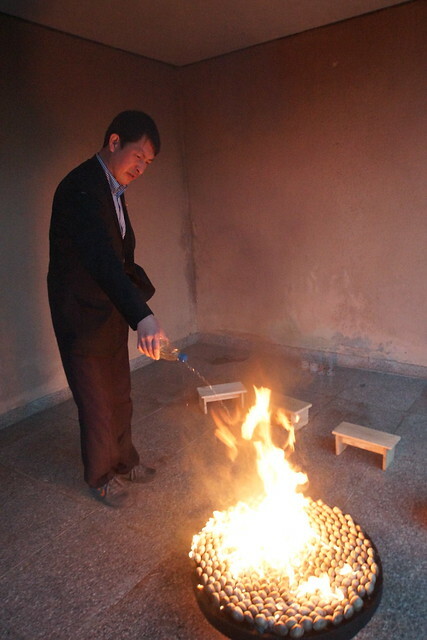 The petrol clambake, however, was fully North Korean. 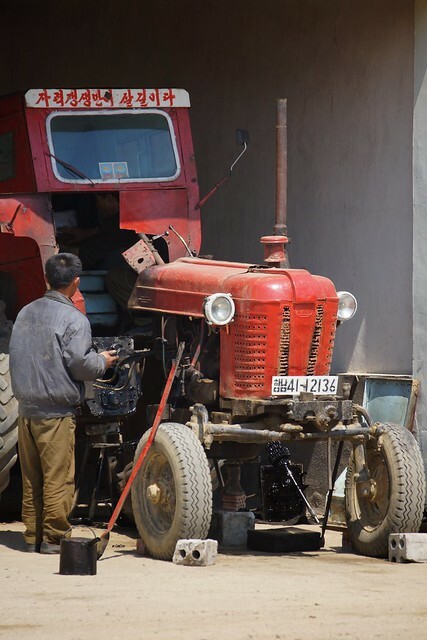 Like much I saw in North Korea, they used unconventional means to solve problems by themselves. No charcoal or wood to bake clams? No problem. Just douse them in gasoline! Most people would think they clams would come out tasting of fuel, but I’m happy to announce that they were actually delicious. 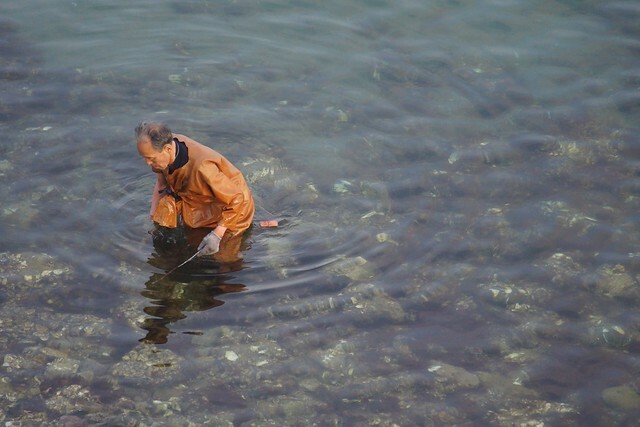 Fresh, clean, and tasting of nothing but clam! 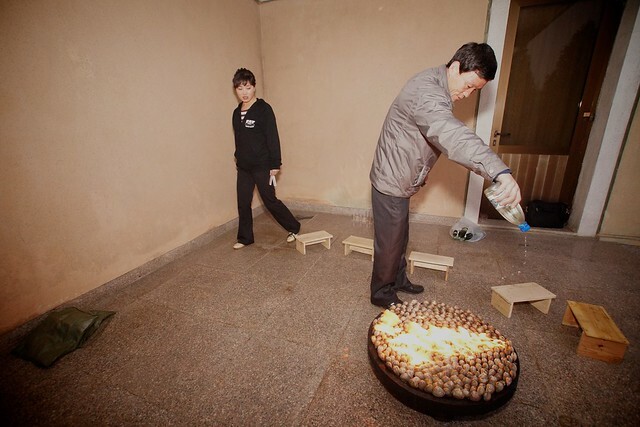 Nampo Hot Spring Hotel petrol clam bake. Would you go back? Suggest others to travel there? I certainly would! Actually, I think the second trip would only be more fun than the first. Like anyone on their first trip to North Korea I was quite a bit scared going in. However, the nerves quickly dissipate when you meet your amazing guides and realize that you’re going to be just fine, but I can only imagine that a more relaxed mood going in will only enhance my second trip. I would highly advise anyone who can should organize their own trip and choose their own itinerary. 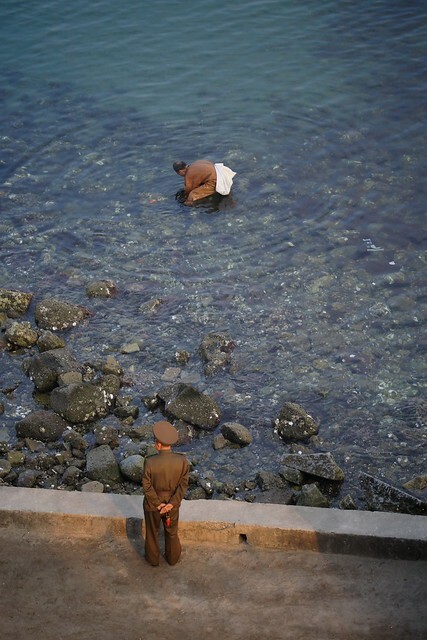 To get the most out of a trip to North Korea, find an interest of your own that you can mirror in the North Koreans. They’re not the Taliban and they enjoy having a good time with any number of western things. 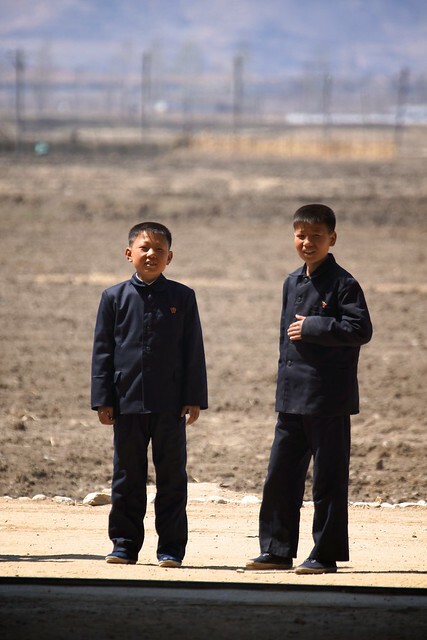 If you’re a surfer, organize a surfing trip in North Korea. If you’re a chef, organize a local food tour. 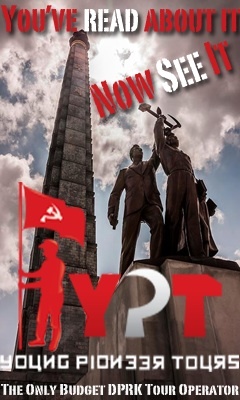 If you’re a cinema fanatic, get yourself into the Pyongyang International Film Festival! The options are literally endless and by organizing a tour that matches your own interests, you will get a greater insight into the culture and country. Josh Thomas and a commander on the North Korea DMZ. 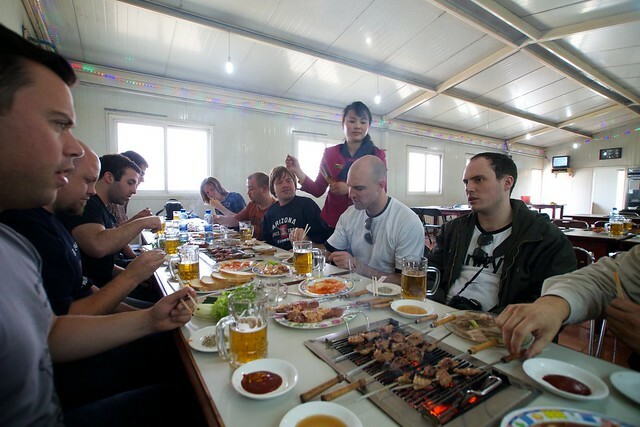 Clam BBQ cooked by a sprinkling of lighted gasoline in Nampo, North Korea – eat your heart out Anthony Bourdain! The petrol clam BBQ is an activity I have always wanted to do but have had difficulty arranging until now. 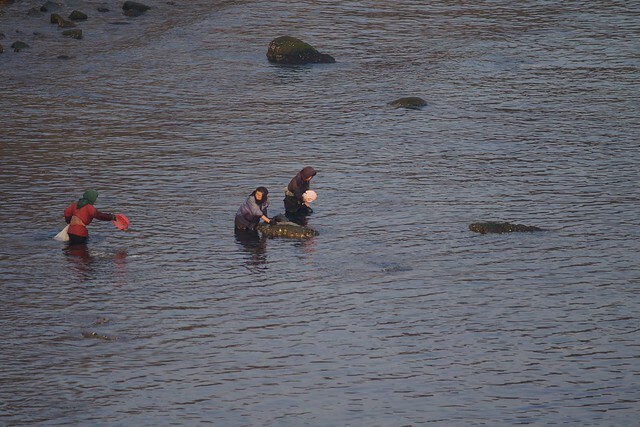 During certain times of the year the water is too polluted to safely eat the clams. 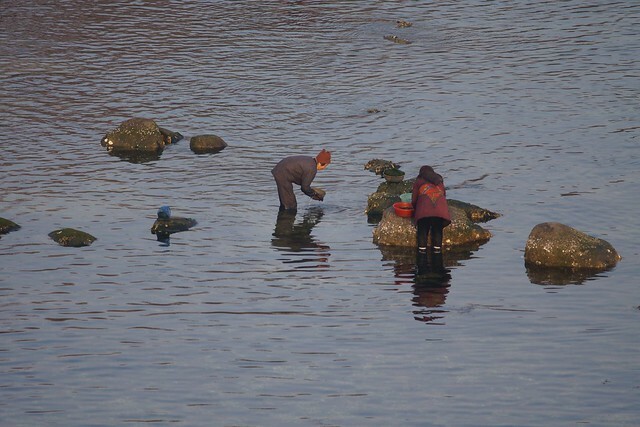 The activity is also dependent on arriving early enough in Nampo to arrange a fresh batch of clams to be bought from the local fisherman. 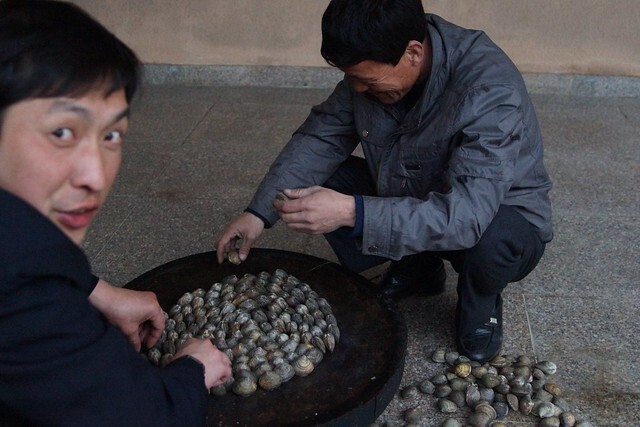 Only the West Coast clams of Nampo can be eaten his way. These clams don’t open up when cooked, allowing minimal gasoline to seep into the tasty bits. 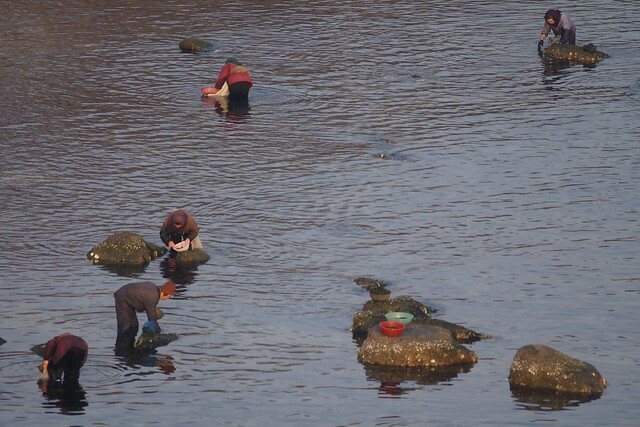 To make sure everything is safe to consume our North Korean guides insist on a large supply of soju and rice liquor to wash everything down with. 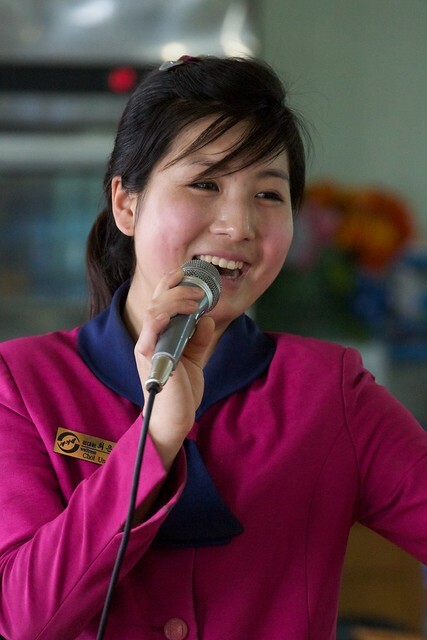 My look behind the scenes of the DPRK tourist experience wouldn’t be complete without introducing the famous singing and dancing waitresses of the Pyongyang lamb BBQ restaurant. The girls are also available for catering; long time readers might have seen them cooking and dancing at the Mt Taesong Amusement park in my Ultimate Frisbee tournament post. 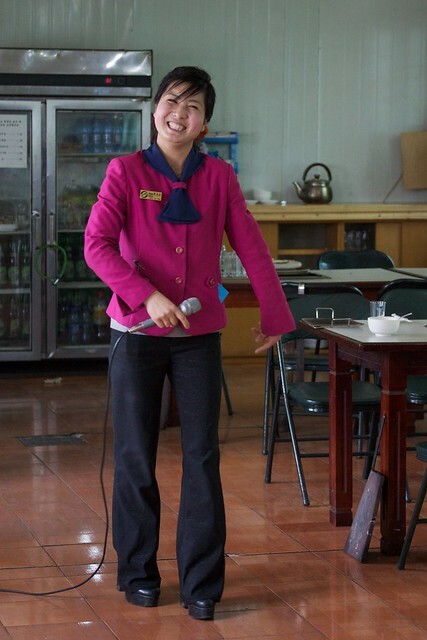 Cute, flirty, and always ready for a little dancing, relaxing with these girls is always a highlight of any trip to Pyongyang (at least for the guys) – they serve up one of Pyongyang’s tastiest lunches too! 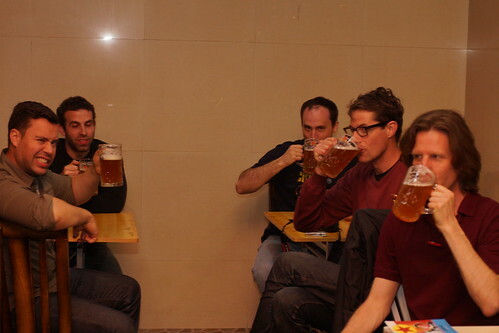 For my April 2013 trip I’m bringing in a group of beer aficionados; top of their request list is for a visit to the Pyongyang Paradise Bar and Microbrewery. The beer is cheap and tasty, if sometimes off color, and the facility is atmospheric and relaxing. 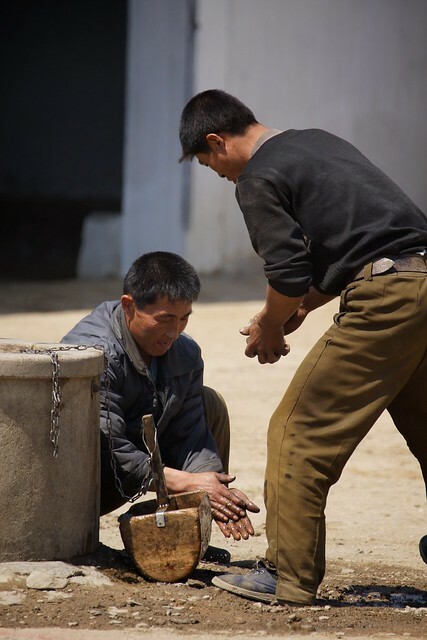 Just don’t expect to hang with locals here; this may be a haunt for the North Korean elite but only expect to get a quick glimpse as they make their way to one of the brewery’s private rooms. The bar and brewery is located on the top floor of the foreign currency Paradise Department Store. A visit here to check out the goods and stock up on some beer snacks before going up to drink is often possible. Above our North Korean guide Ms. Han walks the aisles. 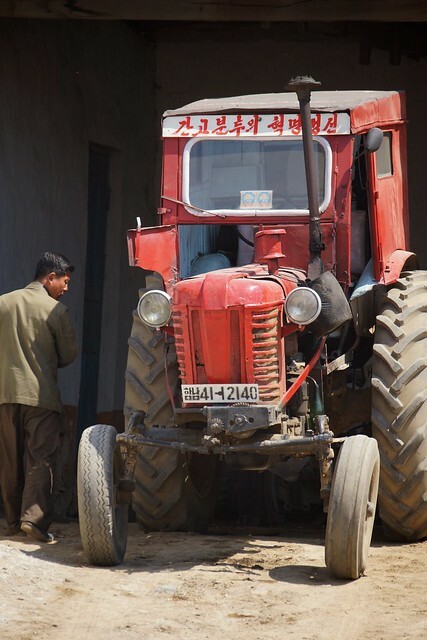 Info on the North Korean co-operative farm system is hard to find online, web searches on the subject bring up this blog as a top hit, but I do remember learning from books I read for my pre-trip background studies that those who live and work on co-operative farms have a fantastic standard of living (by North Korean standards), with the farms being profitable enough that the workers and families living within the cooperative system typically have more material goods and higher savings compared to average workers from Pyongyang. I fly to Europe in a few weeks and had plans to meet up with some of my Dutch friends for dinner at the Amsterdam Pyongyang Restaurant, the only North Korean state run restaurant outside Asia. Unfortunately I just learned the Amsterdam Pyongyang Restaurant has closed, and not without a little controversy. This writes the newspaper. The tent was an initiative of two of Amsterdam that the ties between our country and the Asian dictatorship wanted to tighten. That did not work, because the owners had a fight with their North Korean personnel. The workers complained that they barely got paid and that there was exploitation. Director Remco van Daal was in turn the impression that the whole operation was a deliberate plan by the Koreans to gain access to the Netherlands and to obtain work permits. Lowering of the whole affair has been provisionally fill of everything with North Korea faces. “We have done this out of idealism and we are very far. But it’s about. I do not think we ever go back to that country.” – internet translation from Dutch Telegraph article. Accusations and counter-accusations abound: the Dutch partner says the restaurant was drained of money by the Koreans so they could start over without him, the Koreans say the Dutch guy didn’t pay his share, including wages. Indeed, a court ruled yesterday that the employees are owed payment by the Dutch company. 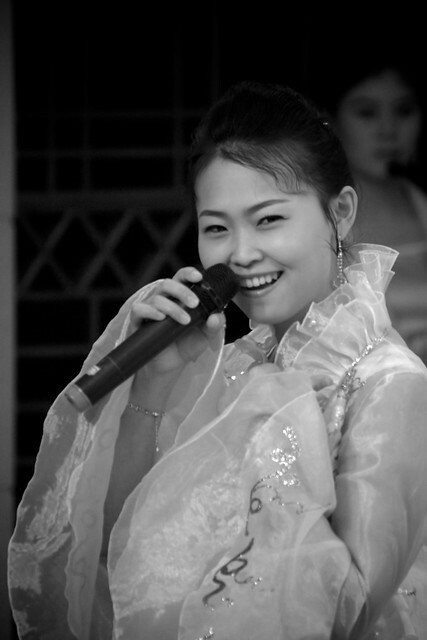 Despite whatever hanky panky that lead to the closing of the Amsterdam Pyongyang Restaurant I still highly recommend you make a visit to one of their remaining Asian branches for a fantastic night of exotic dining and unique entertainment. The list of cities with a Pyongyang restaurant can be found here, but make sure to double check locally before heading out. 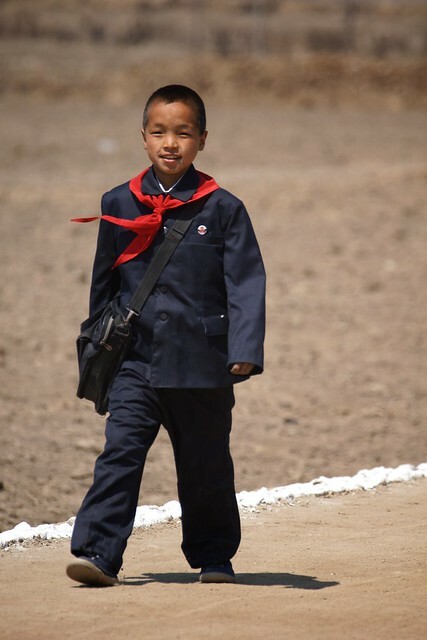 For those who have enjoyed this blog and are curious about how to make a donation that will directly benefit those in need in the DPRK please let me introduce the Love North Korean Children project. 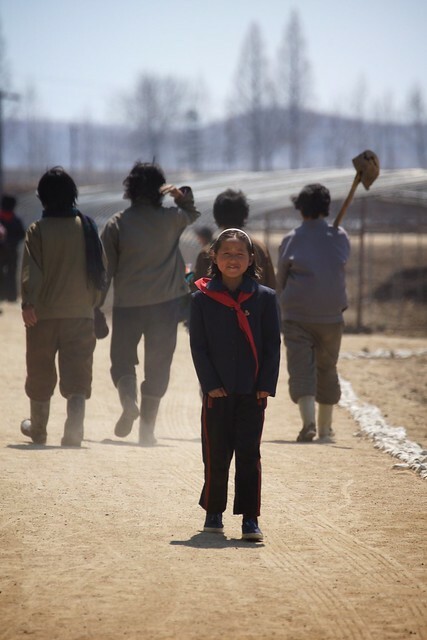 Run by Manna Mission of Europe, a U.K. registered charity organization, the main purpose of the Love North Korean Children project is to help impoverished children, often orphans, in the Najin-Sonbong area and other places (in Pyongyang and far away from the capital). We are running bakeries for the supply of staple food. That means to provide self-help, because we do not deliver bread to North Korea! We deliver flour and employ staff in the country. Therefore a strict monitoring is guaranteed. 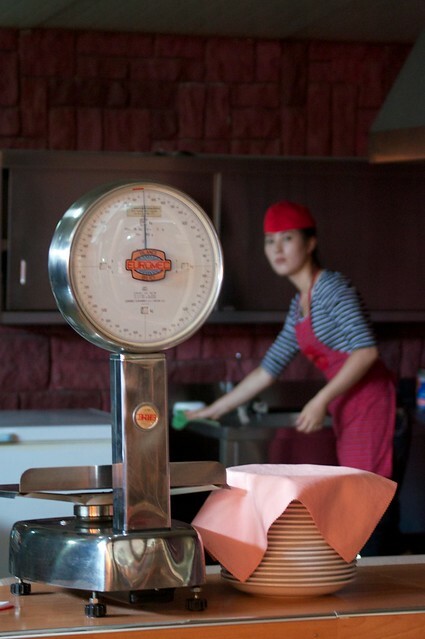 Each bakery has a capacity of feeding 4,000-10,000 children and the staff. We currently have 26 possible locations for bakeries and orphanages; the construction and opening of such facilities depends on the funds we receive in the future. We reached an agreement with the North Korean government to get the estate for bakeries free of charge. So all the money goes directly towards providing humanitarian assistance. The flour is delivered from neighboring China to save transportation costs. Photos from the 2010 bakery inspection tour. To date, the charity has built 4 bakeries. 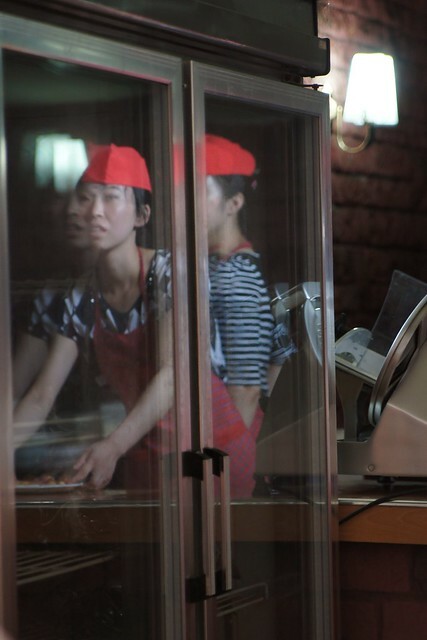 The first 3 (located just outside Pyongyang, Hyangsan and Rason) are fully running and provide 5000-6000 children with one steamed bread bun per day. The newest bakery in Sariwon is fully set up and aims to feed 5000 children every day but is currently unable to start production due to a lack of funds. Money is needed to purchase the flour to make the bread (this is bought in China) and also to buy the coal to stoke the fires. Please note that no money is actually taken into the country. We would like to raise funds to support this bakery in Sariwon. We know that every single donation goes in full directly towards the project. 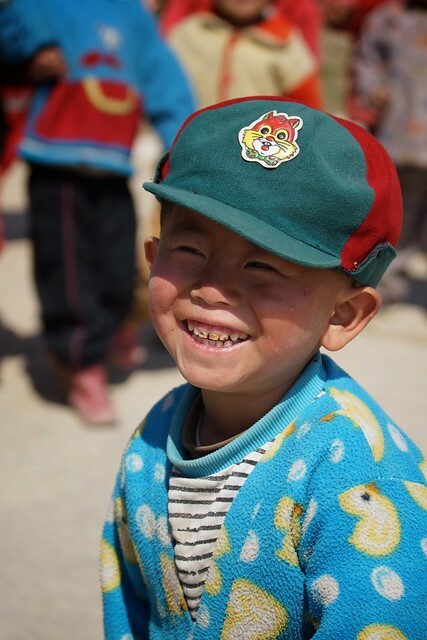 The running costs for the bakery are approximately EUR 7000 per month and this provides 5000 children in the area with one steamed bun per day – this might seem a little amount to you but to them it makes a huge difference. It therefore costs as little as EUR 1.50 to feed one child for one month – and under EUR 20 to feed one child for one whole year. 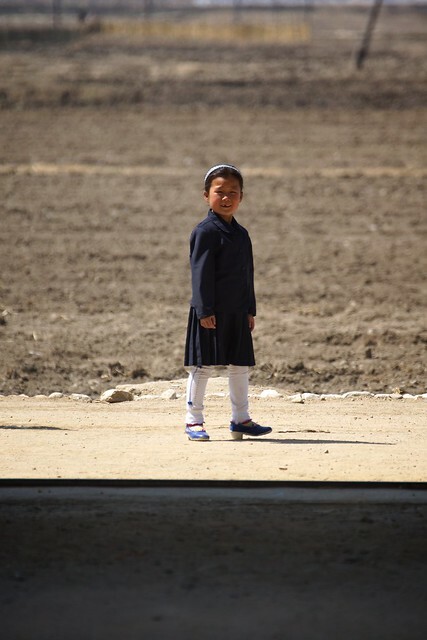 Donations can be made directly to the Love North Korean Children project at their PayPal page, or via Koryo Tours at PayPal links on their charity info page. Remember – as little as EUR 1.50 will feed one child for one month – and under EUR 20 will feed one child for one whole year! 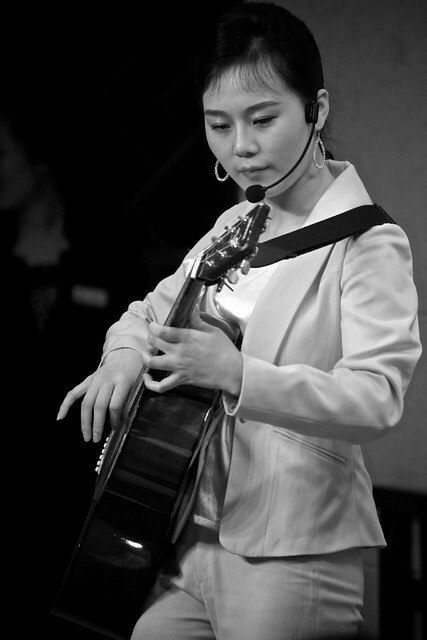 Live entertainment at a North Korean state run restaurant in Dandong, China. 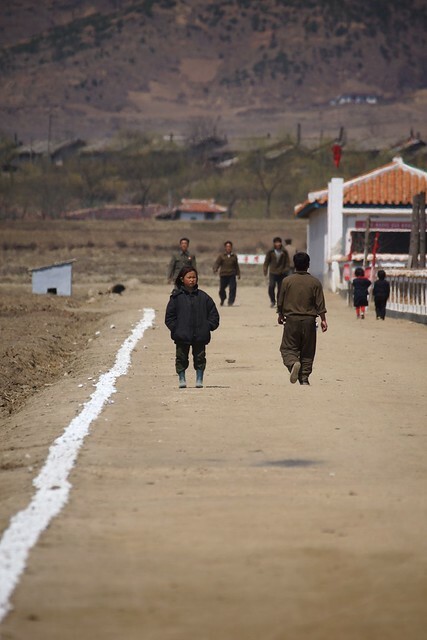 Traveling to Asia but don’t have enough time to visit North Korea? 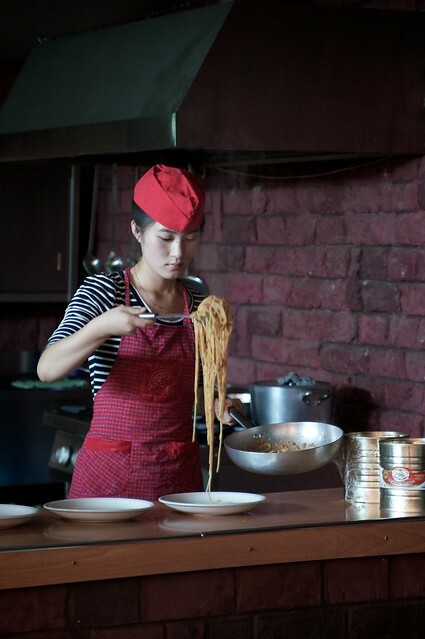 It’s possible to get a taste, literally, of North Korean culture at one of the many state run North Korean restaurants located in the East and Southeast Asian region. 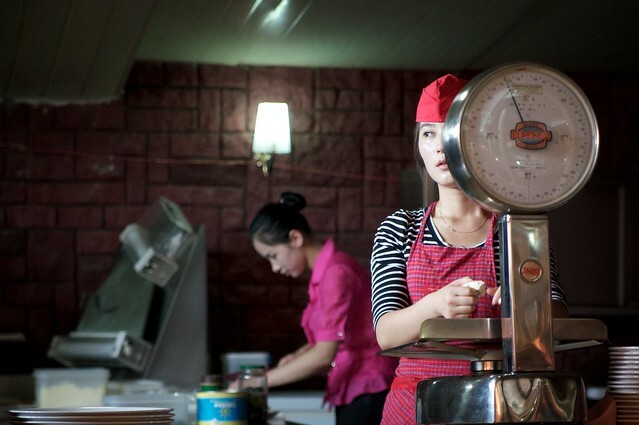 At the Pyongyang restaurant chain you can get amazing North Korean cuisine along with music and dance shows performed by actual North Korean waitresses. These restaurants are reportedly run by the infamous Room 39, the North Korean bureau that is tasked with acquiring and laundering foreign hard currency and the distribution of foreign luxury goods to high party officials. The Pyongyang restaurant is the perfect place to hang out at if you are looking to rub shoulders with North Korean spies and secret agents. All the waitresses are required to live on premises and are closely watched by state security agents – reportedly several branches in China were shut down after escape attempts. 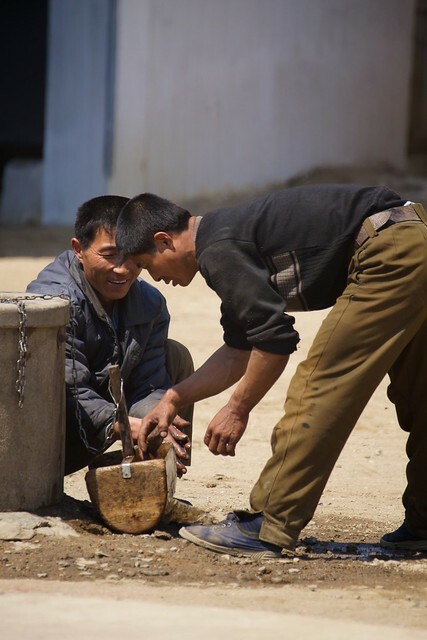 Clientele at branches close to the North Korean border are mainly curious Chinese and North Korean businessmen, while branches further afield focus on the South Korean businessman trade. Wikipedia reports that the Pyongyang restaurant chain operates in the major cities close to the North Korean border along with locations in Beijing and Shanghai. Outside China you can enjoy the North Korean experience at a Pyongyang restaurant in Bangkok, Jakarta, Pattaya, Siem Reap, Vientiane, and Amsterdam. 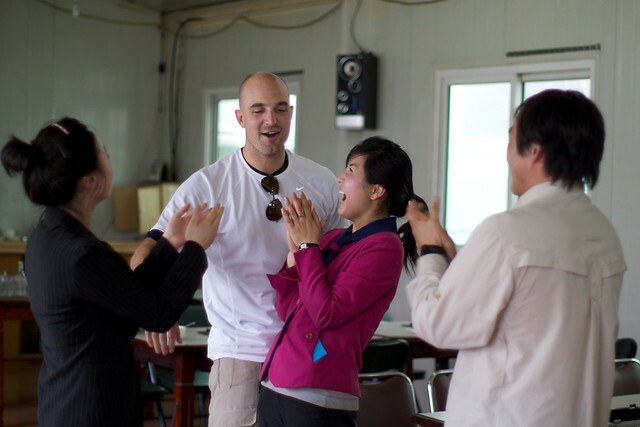 My good friend Jordan Harbinger, co-founder of The North Korea Blog, and I visited a North Korean state run restaurant during our visit to the Chinese/North Korean border city of Dandong. 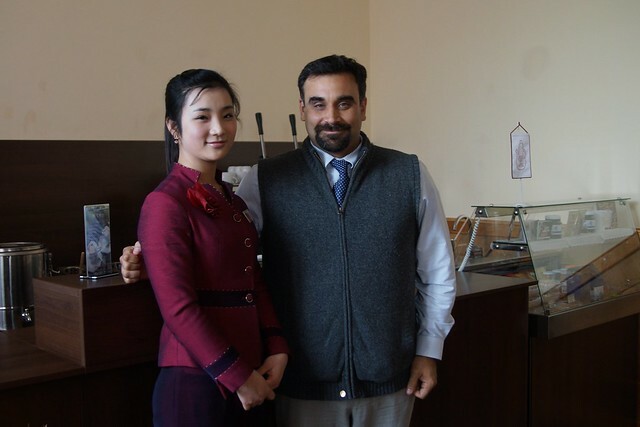 We stopped by the Lui Jing restaurant, and although what I write about above deals with the Pyongyang restaurant chain, we were assured that the Lui Jing restaurant was also North Korean state run and would provide the most authentic North Korean meal in the city. 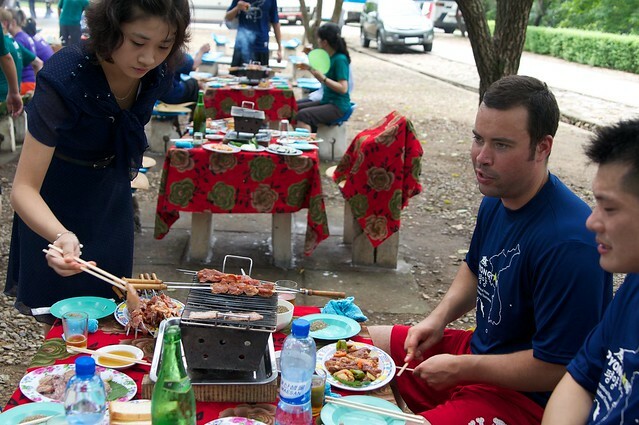 While in North Korea our meals were always adequate but seemingly dumbed down for our western palette. At the Dandong Lui Jing restaurant we were served up heaping dishes of the best Korean food I have ever had. We dug into a serving of Yook Hwe, a cold raw beef and raw egg dish that was fantastic, along with bulgogi BBQ (we ordered 2nds), and a gigantic fluffy shrimp and octopus omelet. 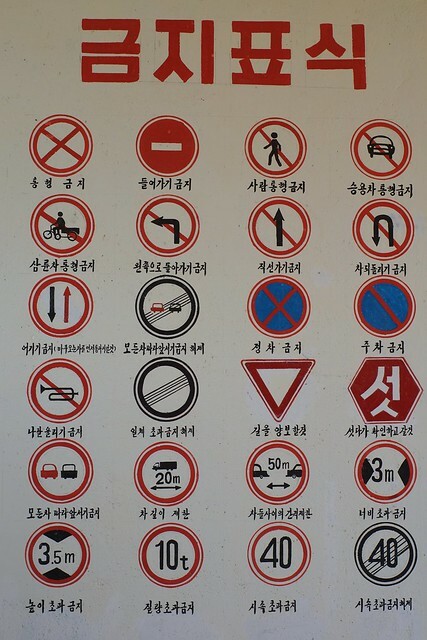 Taking photos is not allowed in most North Korean state run restaurants, so I never got pictures of our dishes, but when the floor show started the waitresses used sign language to indicate we could snap some shots – as shown in the pics above. The waitresses were totally perplexed by us, I’m guessing they don’t see too many western foreigners stopping by at the Dandong branch, but of course we charmed them with our limited Korean language skills and smiles, and had the entire waitress staff abuzz chatting about our every move. We visited two nights in a row and was granted the special privilege, despite a no photo policy, of taking Polaroids and sharing them with the girls there. Exploring cuisines from around the world is one of the main reasons I have traveled so voraciously over the years, and while I love food and eating, I don’t really have the expertise to write about North Korean cuisine – I will leave that to the wonderful Juche Vegan blog. 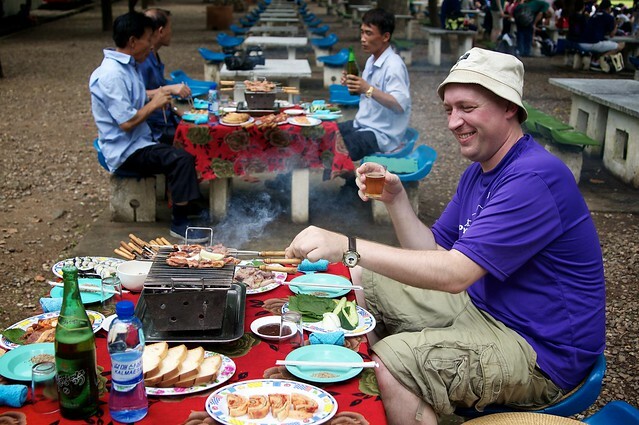 Instead I will use this post to highlight the North Korean dining experience available to tourists on a visit to the DPRK. Traditional Korean lunch at the Kaesong restaurant. 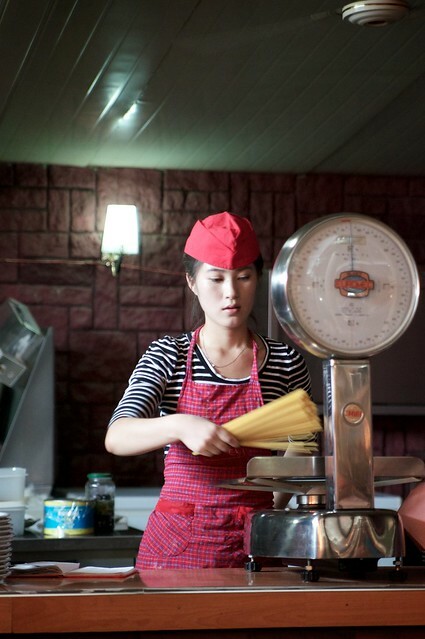 Waitresses serve a traditional Korean lunch at the Kaesong restaurant. 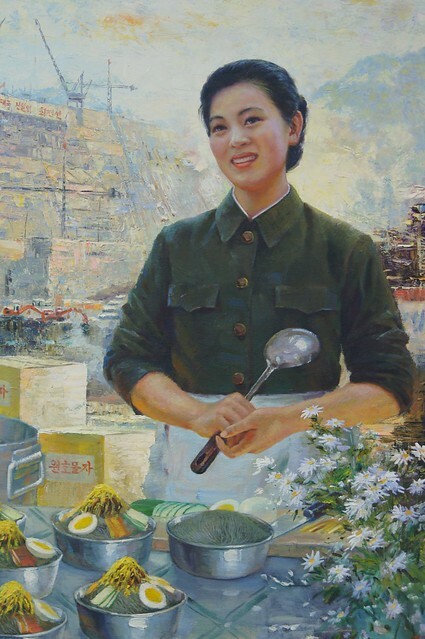 It was firmly impressed upon us during our orientation meeting in Beijing that while malnourishment still remains a major problem in the DPRK, the money paid for our trip would more than adequately pay for all the food we would consume on our visit – our DPRK dining experience would in no way be taking food out of the mouths of unfortunate North Koreans. The quantity of food during our meals was always adequate while quality of the various meals ranged anywhere from average to fantastic. My favorite meals were the Korean BBQs while the most uninspiring were the buffets and set meal spreads normally found at the various hotels we visited. Some of the specialty restaurants presented nice Korean dishes such as Bibimbap and cold noodles, but I found the meal served at the Korean hot pot restaurant in Pyongyang to be quite bland. 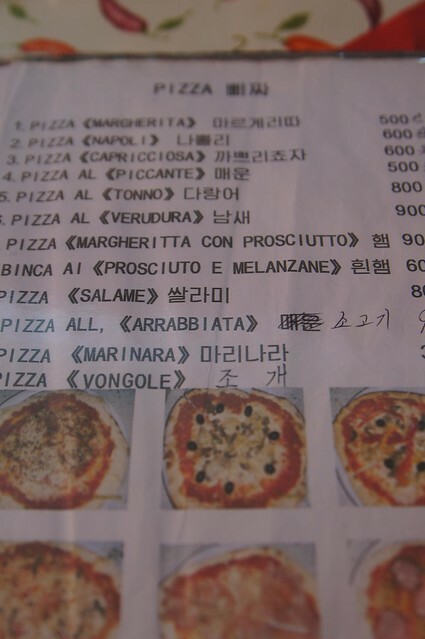 The most famous specialty restaurant in North Korea is the Pyongyang pizzeria, and while they specialize in authentic Italian cuisine (their pizzas are excellent), they also have many standard Korean meals on the menu. In addition to my pizza I ordered the most exotic thing I could find on the menu (my own little test of their food supply situation), a spicy and fresh Korean style clam dish, it was excellent and served up promptly. 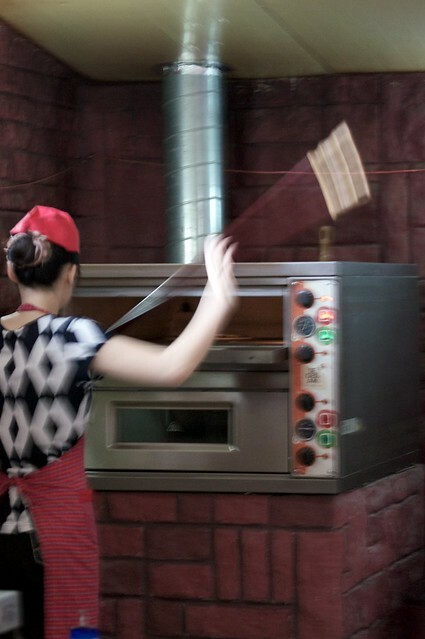 More about the Pyongyang pizza restaurant here. Pasta dish at the Pyongyang pizza restaurant. 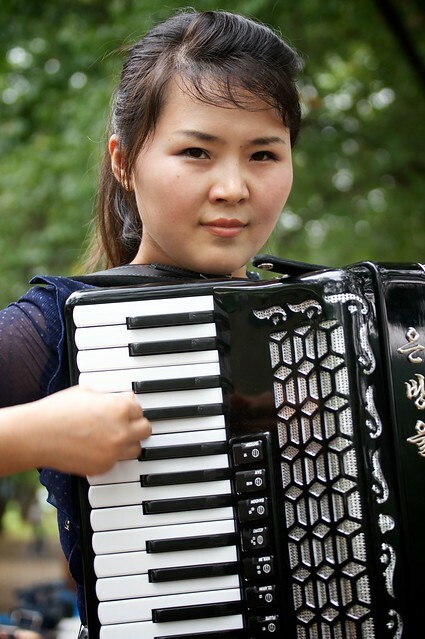 No true social outing would be complete in North Korea without a little live music, and on multiple occasions our waitresses serenaded us with the popular folk classics accompanied by either the piano or accordion. 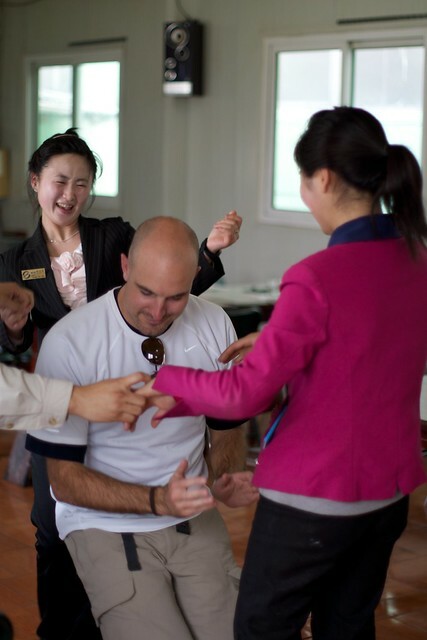 During our BBQ in the park at the Pyongyang Ultimate Frisbee tournament the scene became borderline scandalous when our singing waitresses grabbed us to dance, and to the absolute amazement of our western guide, I had the first North Korean/American booty bump session since god knows when. 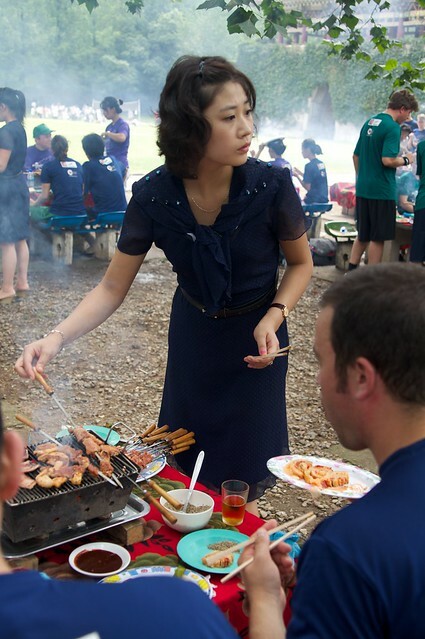 BBQ in the park with the singing waitresses of Pyongyang. 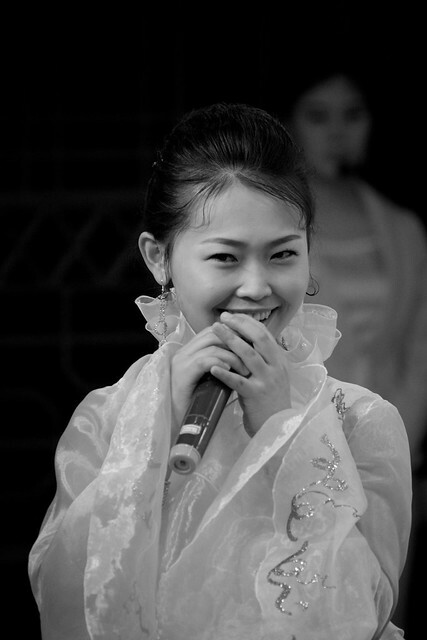 Dancing with the singing waitresses of Pyongyang. 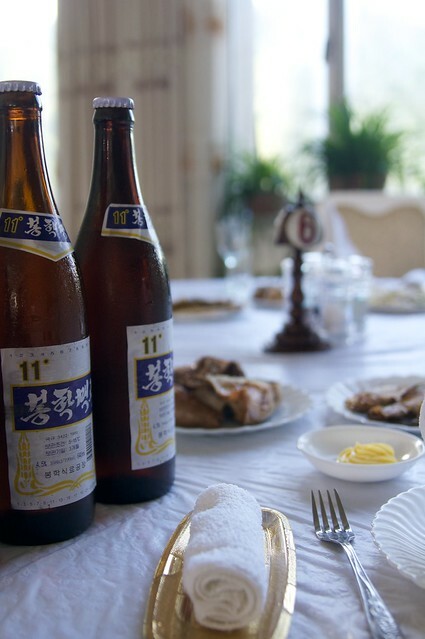 Beer is plentiful at all North Korean meals, and while not always cold, at least one big bottle is usually included with lunch and dinner. At the Mt. Myohyang hotel restaurant one of us ordered a 2nd round of beers for the table, these were priced at about 1 USD per big bottle, but later one of us walked to the restaurant bar to order directly from the cashier, bottles bought here were only 50 US cents, that’s a 100% markup per bottle just for the 15 foot walk from the bar to the tables! Lunch and beer at the Mt. Myohyang hotel restaurant. Our North Korean guide at the Mt. Myohyang hotel restaurant. We learned about the North Korean black market while relaxing at the BBQ lunch during the Pyongyang Ultimate Frisbee tournament. One of us slipped our guides about 5 US dollars and asked them to pick us up some beers. Normally all financial transactions for foreigners are controlled through the government set rates at approved stores. We had been accustomed to paying about 1 USD per big beer, but after having gained our guides trust, and at this informal drinking party in the park, the power of our 5 US dollars on the black market bought us a BMW trunk load full of beer! 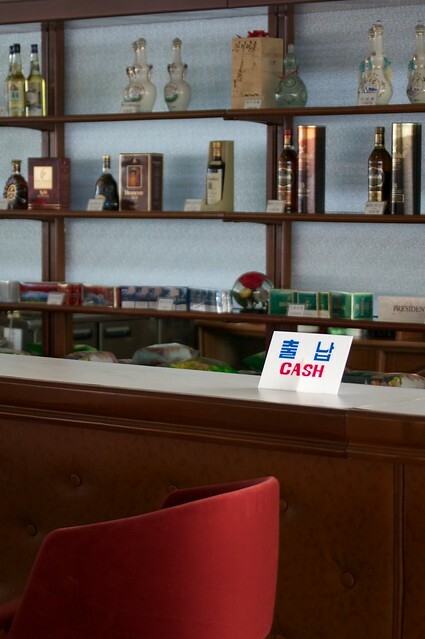 Although we didn’t visit, there is a new fast food hamburger restaurant in Pyongyang, supposedly there you can pay using a North Korean debit card. I obtained one of these debit cards at the Yanggakdo hotel but unfortunately its system was down and I was never able to charge it up with a little cash. I also saw a Mexican burrito stand at the Pyongyang fun fair. This was set up for locals using local currency, and although I missed the chance on the last trip, if the stand is still there when I go back in April I hope to have my guide buy me a burrito! For something a little more on the exotic side try some North Korean ostrich. Ostrich husbandry was introduced into North Korea as a way to help feed the starving masses, it didn’t work, but the North Korean ostrich farms remain (we were allowed to visit one on our tour) and ostrich meat can be found on menus of the high class Pyongyang restaurants. Want something even more exotic? 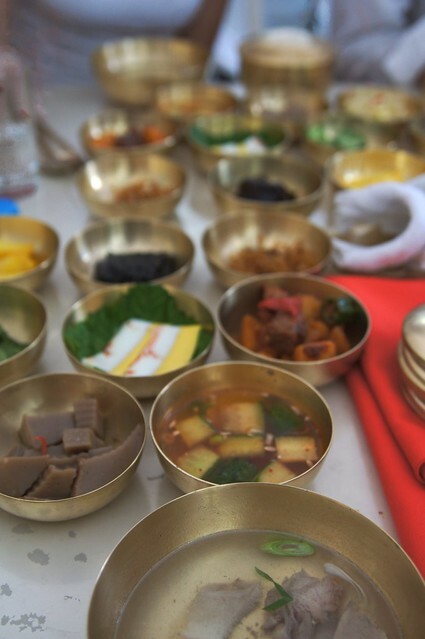 Try the dog soup available at the Kaesong folk hotel for 5 Euros a bowl – I did! 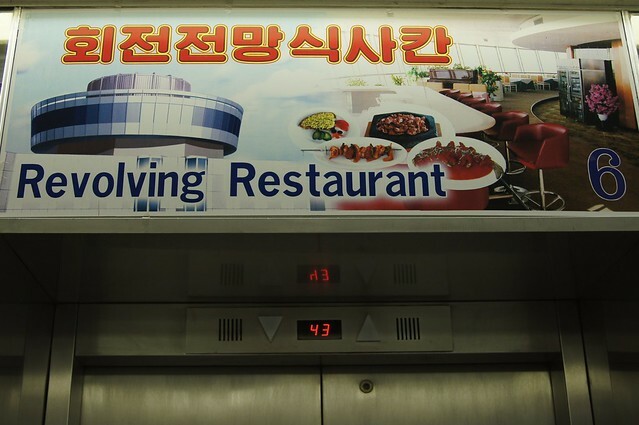 The Yanggakdo Hotel revolving restaurant and bar. Coffee, tea, and refreshment rest stop on the highway from Pyongyang to Kaesong.